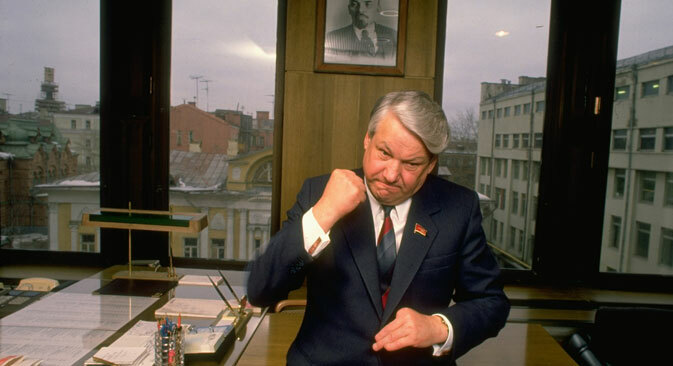 Why does Navalny resemble Yeltsin? Russia Direct Exclusive: Harvard Professor Timothy Colton, the author of a bestselling biography of Boris Yeltsin, explains how the perception of Russian political leaders impacts the image of Russia in the West and how opposition leader Alexey Navalny is both similar and different from the first Russian president Boris Yeltsin. Timothy Colton, an acclaimed Harvard professor and a prominent expert on Russian politics, visited Moscow to present the Russian version of his book about the country’s first president, Boris Yeltsin, Yeltsin: A Life. In this exclusive interview with Russia Direct, Colton analyzes how opposition leader Alexey Navalny is both similar and different from Yeltsin and whether or not he can repeat Yeltsin’s political success. Russia Direct: What is the “Yeltsin phenomenon,” from your point of view? Why do you call him a "paradoxical hero"? Russia Direct is an analytical website with the focus on foreign policy. Its premium services, such as monthly analytical memos and quarterly white papers, are free but available for subscribers only. For more information about the subscription, please visit R ussia Direct. Timothy Colton: There is a chapter about the Yeltsin phenomenon. And it’s about his emergence as a national political figure in the late 1980s. He seemed to be a fairly standard Soviet official (or chinovnik) who suddenly behaved so differently. It was remarkable because until the late 1980s – the only way you could become a national political figure was becoming a member of the top Soviet leadership. And everybody worked in the shadow of the General Secretary. Yeltsin was paradoxical in the sense of being rather enigmatic. The biggest paradox is how it could possible to be that somebody who seemed to be a fully formed product of the whole system was the one who turned out to break with the past. T.C. : It was a turning point for him. It was a crisis that shocked him personally. If you look carefully at photographs at Yeltsin, you’ll see that he really starts to age after 1993 [because of] the burden of office. By the end of that year, he has responsibility for everything and it becomes more and more clear he has been having difficulty in delivering on his promises. The main result of that crisis was to put more responsibilities on his shoulders, which was probably healthy for him as well as healthy for Russia. As for the crisis itself, he used force; he used force in Chechnya a year later. He was willing to do that. …Yet he didn’t abuse the power. RD: What about Russia’s opposition leader and mayoral candidate Alexey Navalny? Do you think that Navalny is the type of person who can replace Putin in the future? T.C. : He is now a national figure, a name that many people recognize because of the campaign against Putin. If you compare him with Yeltsin 25 years ago, there are some certain limited features that they have in common including the populism, the kind of flair for the dramatic, and the ability to rally people. The main difference is that Yeltsin had experience with the state itself, in government, and Navalny does not. And this is a consequence of what Putin did, enclosing the political arena after 2000. Is the West inclined to idealize Yeltsin and demonize Putin? How does the publicity campaign for Russian leaders affect or bolster the image of Russia? How did the communication with Russia's political leaders, their relatives and opponents impact biographers? What are the most vivid challenges of writing a biography of political leaders? Find the answers in the full version of the interview published at Russia Direct.